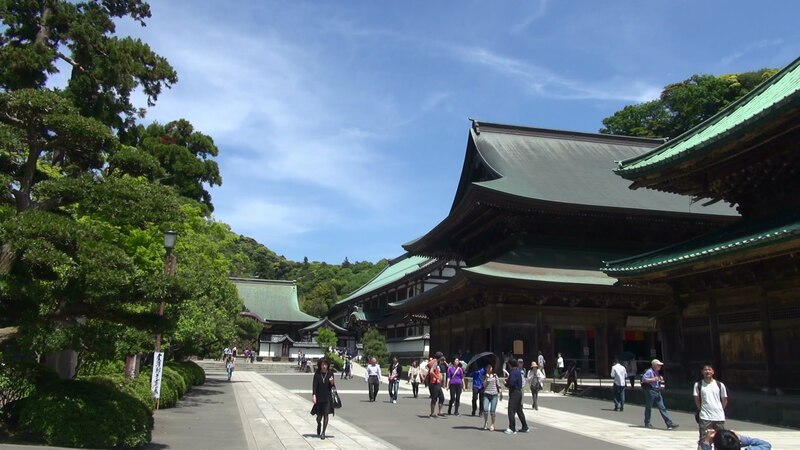 Kenchoji Temple, which is one of the “Five Great Temples in Kamakura”, is the most prestigious temple among the temples in Kamakura and is famous as a representative tourist attraction in Kamakura. It is also attractive that you can enjoy seasonally such as cherry blossoms, hydrangea and autumn leaves, and it is crowded with many visitors every year when you see them. In 1253, Kenchoji Temple was founded by Tokiyori HOJO, who was a regent at the time. Daolong LANXI (Doryu RANKEI in Japanese) was invited from Song dynasty and created as Japan’s first full-scale Zen Buddhism specialty dojo. “San-mon Gate” (temple gate), Buddha Hall, Hatto (Lecture Hall) are in a straight line, and it is a beautiful zen temple that Kamakura boasts, still retaining the distinctive architectural style of temple buildings. Kencho-ji was the first Zen temple that opened the first pure Zen training hall in Japan, with more than 1,000 monks training there at one time. 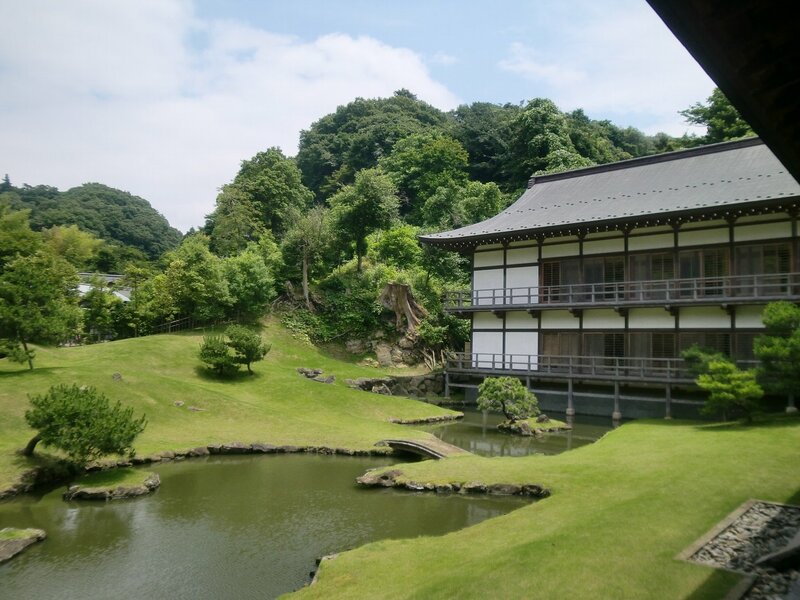 It is the oldest temple among Zen temples in Japan. However, due to frequent fires and earthquakes, most of the wooden buildings at the time of the construction of Kenchoji Temple were lost. Most of the buildings seen today are reconstructed with the assistance of the Tokugawa shogunate government in Edo period. 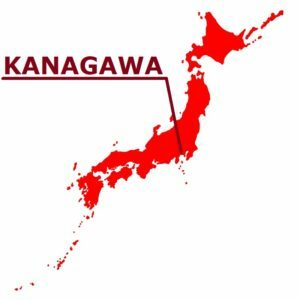 The Great Kanto Earthquake of 1923 suffered great damage, but it was rebuilt and it became today’s figure. 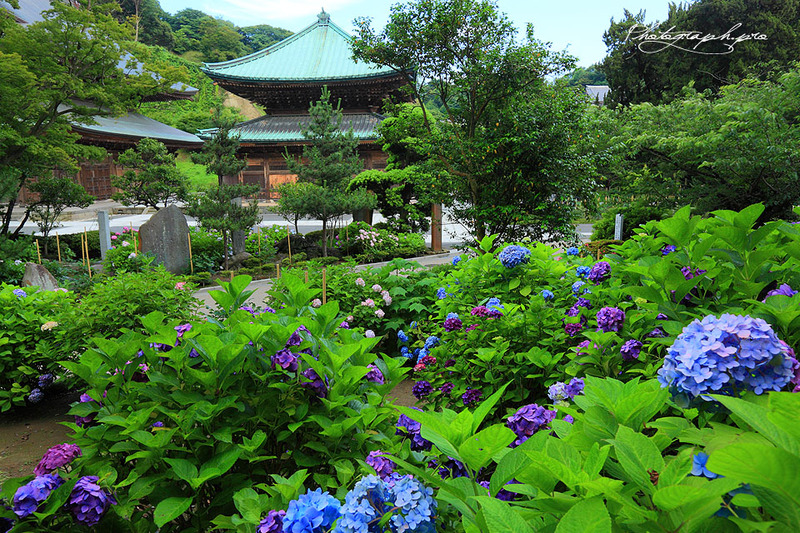 You can enjoy beautiful flowers in each season at Kenchoji Temple. In particular, about 10 Somei Yoshino are planted between the So-mon Gate and the San-mon Gate, and in the spring they bloom beautifully against the San-mon Gate. You can also see the azalea and peony in spring. From September to October you can enjoy bush clover at the stone walls of Myokoin Temple in front of the San-mon Gate, and from November you can enjoy colored leaves at various locations within the precinct. Kenchoji Temple is about 20 minutes walk from Kita Kamakura Station towards Kamakura Station. There are many restaurants with good reputation on the way from the station and it is also recommended to eat. About 30 minutes walk from Kamakura Station. There are also buses from each station. The “Kencho-ji Temple” is the first temple specialized in zen in Japan with a high-profile atmosphere. The Rinzai sect Kencho-ji group’s head temple “Kencho-ji Temple” was founded by Tokiyori Hojo. There was the execution place called “Jigokugayatsu” (Hell Valley) originally, and the temple called “Shinpeiji Temple” dedicated to the Jizo Bodhisattva was built. It seems that Kencho-ji Temple’s Principal image is Jizo Bodhisattva (guardian deity of children) because there is such a reason. Karamon (Chinese-style gate) is the main gate of Hojo (abbot’s quarters) of the Kencho-ji, and has the meaning of the gate which roof is Kara Hafu (Tang gable). It was the inner gate of the Zojoji Temple which was the family temple of the Tokugawa. 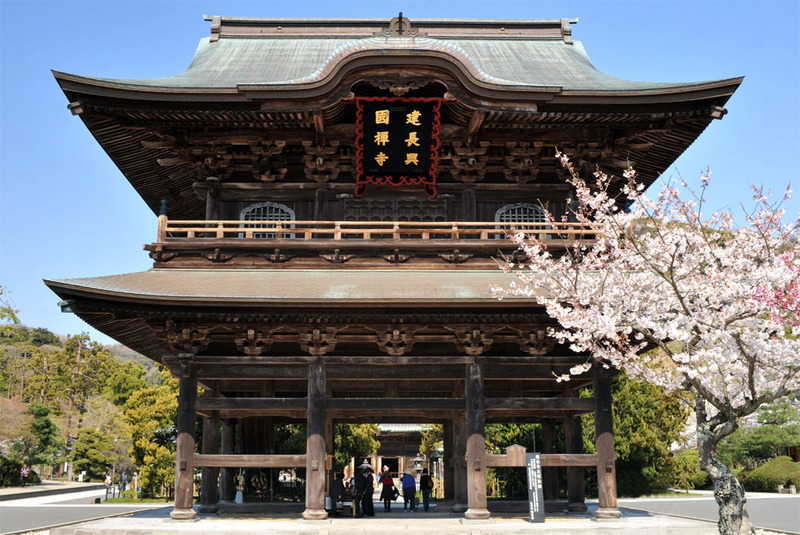 In 1647, it was relocated to the Kencho-ji Temple with the Buddha hall and the inner gate of the Seiraian. Preservation repair was completed in 2011 and the gorgeous figure was restored. 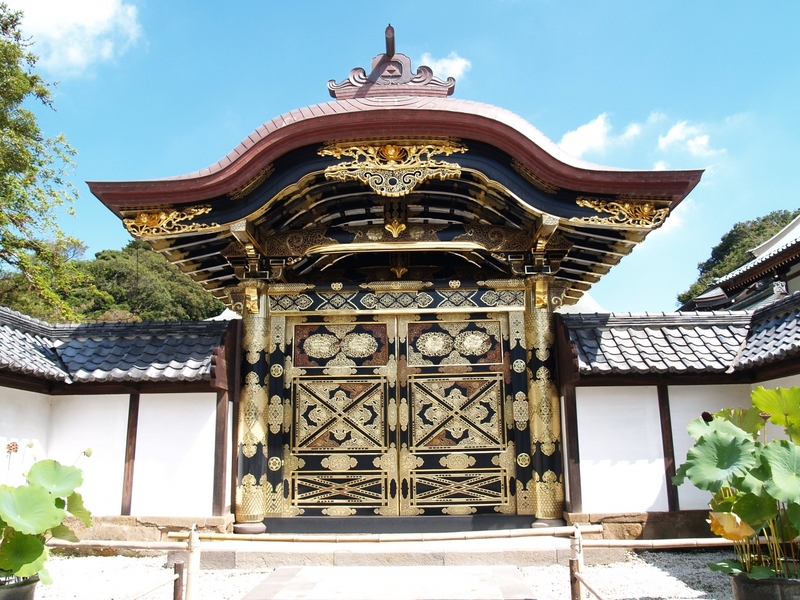 Speaking of the attractions of the Kencho-ji Temple, it is the big and impressive “San-mon gate” (temple gate). The current san-mon gate was rebuilt in 1775. It is the two-story gate that is about 30 meters in hight, representing Kamakura. The Hatto (Lecture Hall) was founded in 1275 at the memorial service for the 12th anniversary of Tokiyori Hojo’s death. However, because of repeated fires, earthquakes, etc., the building at the time is not left. The current Hatto was rebuilt in 1814. It is known as only Hatto in Kamakura, and is proud of its size as the biggest in Kanto area. The Unryu-zu (painting of dragon and clouds) was drawn by Junsaku KOIZUMI as part of the 750 year memorial service of the Kencho-ji Temple. 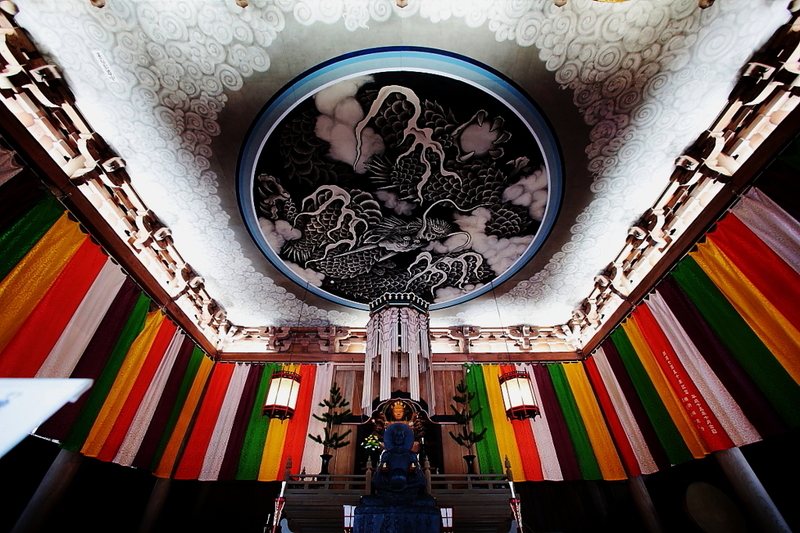 It is the huge drawing of about 10 meters long and about 12 meters wide hung up over the ceiling of the Hatto. In Buddhism, it is said that the dragon tells the teachings of the Buddha to people. It is said that the meaning of this drawing is to shower the rain of “teaching” on a Buddhist monk practicing asceticism.